Away from the city, with no distractions, the Gingerbread House seems like the perfect place to start work on a novel. That’s what former advertising copywriter Tess thinks when she goes there to live with Eleanor, her aged mother-in-law. But Eleanor is suffering from dementia, and caring for her proves tougher than Tess could ever have imagined: feeling increasingly isolated, her only comfort is wine o’clock and weekend visits from her husband. Meanwhile her teenage daughter Katia is helpless to intercede; in the end she can only watch as things fall apart and a tragedy even closer to home surfaces. 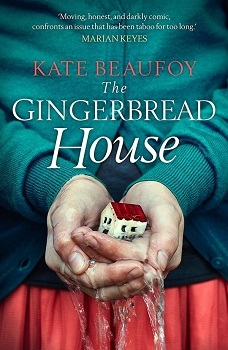 The Gingerbread House is a deeply moving novel: a compassionate and occasionally wickedly funny tale of a family’s agonising struggle with dementia. 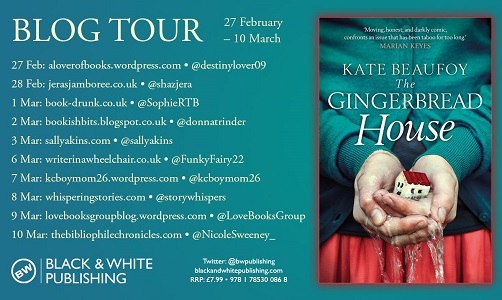 You’d be forgiven with the title ‘The Gingerbread House’ for thinking that this book was going to be a sweet, easy, chicklitesq read. It is far from it. In the fairy-tale of the same name lives a witch. There is one in this book too, well that’s what teenager Katia calls her grandmother who lives there, though she hasn’t always been a ‘witch’. Eleanor, Katia’s grandmother has severe dementia and is extremely demanding, angry, and everything must be done perfectly. When her usual carer takes three weeks off to travel home for her daughter’s wedding, Eleanor’s daughter-in-law, Tess (Katia’s Mother), steps in to help, and stay for the three weeks. Katia decides that she wants to stop with her mum, so she travels with her to stay at her grandmother’s house. Tess though, never thought that looking after her mother-in-law would be so difficult, and all that Katia can do is stand and watch her mum, run herself ragged. The story is narrated by teenager Katia, and opens with her arriving at her grandmother’s house, that she calls ‘The Gingerbread House’. She takes us on a tour of the property, before introducing us to her mother, and grandmother. The style of writing did take me a little while to get used to. I’m used to books being told in the first person, but this felt more personal, and right near the end, you’ll understood why, as there is a big shock to come, one that hopefully you won’t see coming. Unfortunately, from the style of writing I had guessed by chapter five, but believe me it didn’t take away one bit of my enjoyment of the story. The book is exceptionally poignant. It shows you just how much hard work, and how much care someone with dementia needs, whilst at the same time make you realise that this once popular, well-loved person has turned into someone unrecognisable, via this cruel illness. Although heart-wrenching at times, it also has a very dark-humoured side to it. Especially from the jokes that Donn, Tess’s husband tells her, to keep her spirits up. A wonderful, moving book, that will play with your heart strings, give you a little giggle, and shock you with the big twist. Kate has an MA in French and English literature from Trinity College, Dublin. She began her career as a professional actor – winning a Dublin Theatre Festival Best Actress award – before becoming a fulltime writer. As Kate Thompson she has had a dozen novels published, including the Number One bestseller The Blue Hour, which was shortlisted for the RNA award. As Kate Beaufoy her first historical novel – the critically acclaimed Liberty Silk – spent four weeks on the Irish Times bestseller chart. 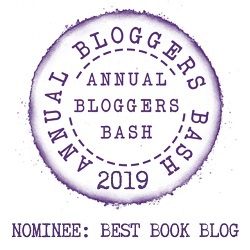 Her latest novel – Another Heartbeat in the House – charted last summer and was shortlisted in the popular fiction category in the Irish Book Awards 2015. Inspired by William Thackeray’s Vanity Fair, it tells the story of the woman who became governess to his children and who may have been the prototype for literature’s most enduring and engaging heroine, Becky Sharp.